The JPL Submillimeterwave Limb Sounder (SLS) is a heterodyne radiometer-spectrometer that measures the thermal emission spectra of gases in the Earth's upper atmosphere across a range of limb tangent altitudes. Abundance proles of stratospheric gases are inferred from these spectra using standard retrieval techniques. The current instrument measures in the 600 to 700 GHz spectral interval using an NbTi superconductor-insulator-superconductor (SIS) double sideband quasioptical mixer and a broadly tunable local oscillator. The radiometric system noise temperature of the receiver system is approximately 280 K at IF band center. The down-converted 4 GHz wide IF band is spectrally resolved and power detected using analog filterbanks and digital spectrometers. Instrument optics provide a field-of-view full width at half maximum of 0.3 degrees to achieve vertical resolution of 1.5 km at 25 km tangent height. of the balloon platform which is typically 38 km. In flight, a full limb scan with calibration views is completed in approximately 300s. This short scan period provides profiles with sufficient temporal resolution to examine the diurnal varying gases through sunrise and/or sunset. Spectral lines of a large number of key atmospheric gases are within the region measured by SLS. These include 35ClO, 81BrO, H35Cl, H37Cl, O3 and isotopologues, HO2, HNO3, CH3CN, HO35Cl, CH3Cl and H2O. The SLS was developed under support from the NASA Upper Atmosphere Research Program in 1989 as a successor to the Balloon Microwave Limb Sounder (BMLS), a balloon 200 GHz receiver for ClO and O3. 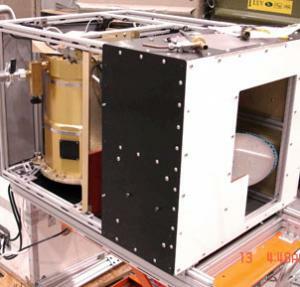 The SLS instrument has been successfully flown singly or with other instruments on high altitude balloons many times over the past decades and on the NASA ER-2 as part of several campaigns including the UARS Correlative Measurements Program, the Second European Stratospheric Arctic and Mid-latitude Experiment (SESAME), the Photochemistry of Ozone Loss in Arctic Summer (POLARIS), ADEOS Validation, the Sage III Ozone Loss and Validation Experiment (SOLVE) and NASA EOS Aura Validation. The sites for these balloon launches included Palestine TX (31N), Ft. Sumner NM (32N), Daggett CA (35N), Fairbanks AK (64N), Aire sur l'Adour France (44N), and Kiruna Sweden (68N).